Narrated by Liam Neeson, The Greeks – Crucible of Civilisation brings the viewer on an amazing historical journey from the rise of this powerful civilization, to its glory and finally the demise of these ancients. Bringing together the three episodes from the TV series, The Greeks – Crucible of Civilisation gives viewers of all levels of education, a very interesting and entertaining glimpse into the founding forefathers of democracy. Linking actual facts with some artistic liberty, the people behind this documentary begin with the birth of this civilization, how it became a philosophical phenomenon and finally the end of the Greek civilization due to an influx of other cultures and conquerors. It’s amazing that after so many thousand years, we have learned so much and so little about this culture, however through the painless research of thousands, they have pieced together a good insight into their motivations and essence of existence. The actors in the movie portraying the real-world ancients such as Socrates or Pericles really assists in giving them a human face and actually helps with the intake of knowledge, rather than hearing a dreary old professor drone on for several hours. 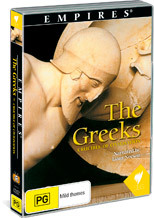 The DVD also focuses on famous battles such as the battle of Marathon or the relationships with their neighbours such as the Persians which is amazing to see, due to the warlike nature of the neighbours and it’s a wonder that the Greeks lasted so long. At the end of the day, this documentary gives the viewer a good insight into many of the characters, myths and wars of the Greek civilization and more importantly that after several thousands of years, the birth of democracy is still as strong as it was then as it is today.